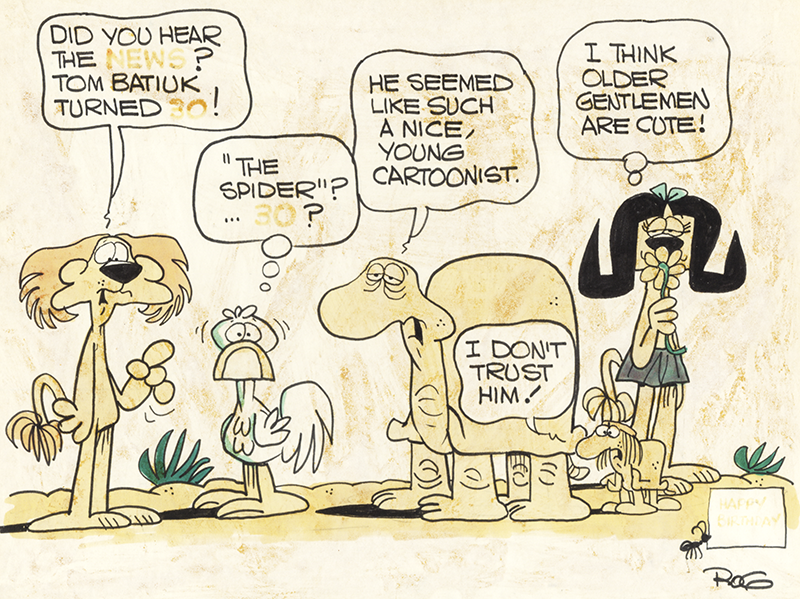 Roger Bollen was one of the true masters of the newspaper comics page. He was the creator of Animal Crackers, Catfish and Funny Business. Roger passed away this past Saturday. To me Roger was by turns an inspiration, a wise and sage counselor, and a friend who never failed to bring a smile. When I was a senior at Kent State, I badgered, cajoled and pleaded for the opportunity to meet with him so I could pour out all of the heartfelt questions I had about cartooning and how you negotiated the path to becoming a syndicated cartoonist. He graciously spent a wintry Saturday afternoon with me talking comics and opening my eyes to the ways of the comics world. Over time we became friends who would enjoy the occasional lunch together and the chance to talk shop which, given our hermit-like existences, was something to be treasured. The cartoon above was commissioned by my best friend from college and created by Rog for my thirtieth birthday. It has remained framed very staunchly on my studio wall these many years. When Roger left comic syndication to work in children’s books and television, some of the heart disappeared from the newspaper comics pages. I missed his work and I miss the man.